ferdi: I saw this problem in "Deutsche Gozeitung", contributed by Tobias Berben, I think. 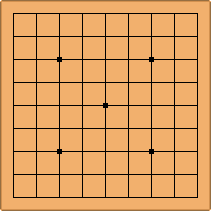 On a 9x9 board, what is the smallest (= fewest stones) living group when you have to construct it only with diagonal moves? Tas: Note: It has to be unconditionally alive, alive even if black passes for the rest of the game.